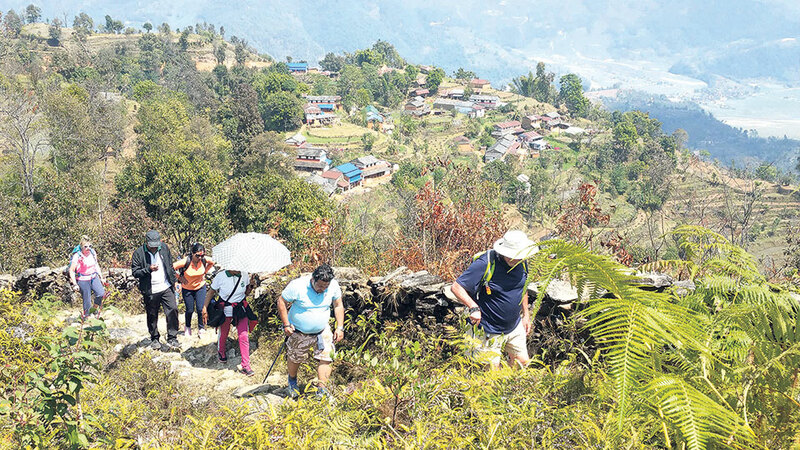 Photo Courtesy: Sushil Poudel / Office-bearers of TAAN and tourism stakeholders enjoy a short hike on the newly explored route. POKHARA, March 20: Trekking Agencies Association of Nepal (TAAN) Western Regional Association has introduced a new trekking route from the popular Fewa Lake for tourists willing to experience the beautiful view of Annapurna mountain range, paragliding flights from Sarangkot and the local lifestyle of the villagers. With this five-hour route, tourits will get an opportunity to experience the life of local villagers along with the natural beauty of lake and mountain. “This route can be operated for two days and if the route can connect to the Panchase. Then it could be of more than two days,” he added. “It can be promoted as an ecotourism venture. Moreover, it is a safe route and there is no problem for accommodation as well.” TAAN is further planning to provide necessary training to locals of the area in order to bring the route into operation sooner. Likewise, TAAN is also preparing to put sign boards in different places along the route. “Old trekking routes are being destroyed by the motorway. This route can benefit both villagers and trekkers,” Adhikari said. 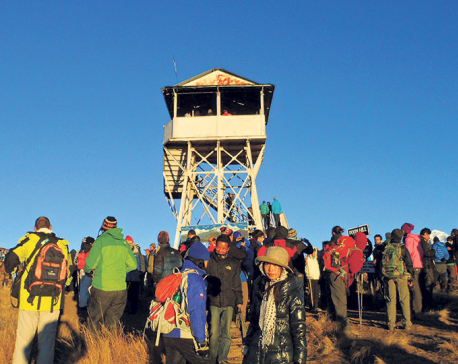 According to him, almost 70 percent of total tourists arriving in Nepal come for trekking. He, however, said that few infrastructures such as restrooms, water taps and resting places are needed to be built for the trekking route. Surya Thapaliya, chief of Nepal Tourism Board, Pokhara, also said that the Pokhara-Lekhnath Metropolitan City was waiting for promotion of the trekking route inside the metropolis. He further said that this route can be promoted as a hiking route as well. As the trekking routes of the country are being promoted in the international market, Thapaliya said that this kind of new trekking routes are essential to discover. “All trekking routes are not necessary to be long routes we can also send tourists for short trekking routes. The only thing we need to do is constructing infrastructures,” Thapaliya added. BENI, Oct 16: The trekking route along the Annapurna Conservation Area is being shorten with the rampant construction of trial roads.